Anyone ever drill out the Gas-In post of a Firestone Keg that had a plastic dip tube and replace it with a stainless steel dip tube? How did you do it and did it seal okay afterwards? Thanks!!! I haven't but know others have. I think it worked well. so I could get some cheap parts. A guy in our club told me recently that you don't even need that gas diptube. I haven't tried it without, but he generally knows what he's talking about. How would that work? I think the gas diptube basically holds in the O-ring, so it only needs to be a couple mm long. Pin-lock gas diptubes are very short. So maybe he could cut his diptube to just fit the bigger top of the hole. CHI company in Calif. is ordering more. Don't know how long that will take. In the ones I've got, the o ring sits on top of threaded receptacle that the dip tube goes into. Although I haven't tried it, it looks like the o ring would just sit on top of that and the post would hold it in place without the diptube being necessary. I've chopped down a few but still have a few more to do. Of course now that I dont take kegs apart to clean them anymore that task may have to wait. PS Gotta get pics of my cleaning system posted. I have a submersible pump for re-cirulating ice water through the IC chiller. Looking at it one day AND a pile of kegs I said "self, there's got to be a better way"
Tube here , QD there, T here and voila! Now I take the lid off the corney, stick it in a big pot containing the pump and some Oxyclean solution. 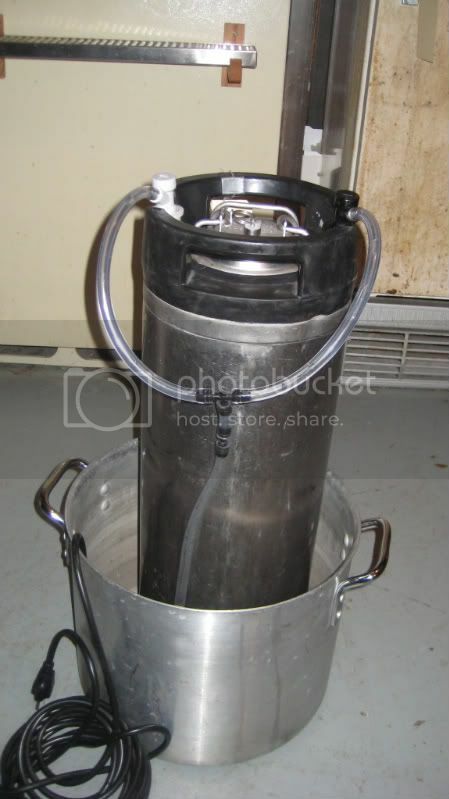 Once the keg is full I disconnect the gas post and let it run in the bottom of the keg via the BEER POST and out the top of the keg. The stainless dip tube does fit in the hole for a short length. So what some of you have said is to cut the stainless dip tube short enough to fit in the hole before bottoming out. Don't see why that won't work and I don't have to drill out the post. I'll try that. Thanks!! !